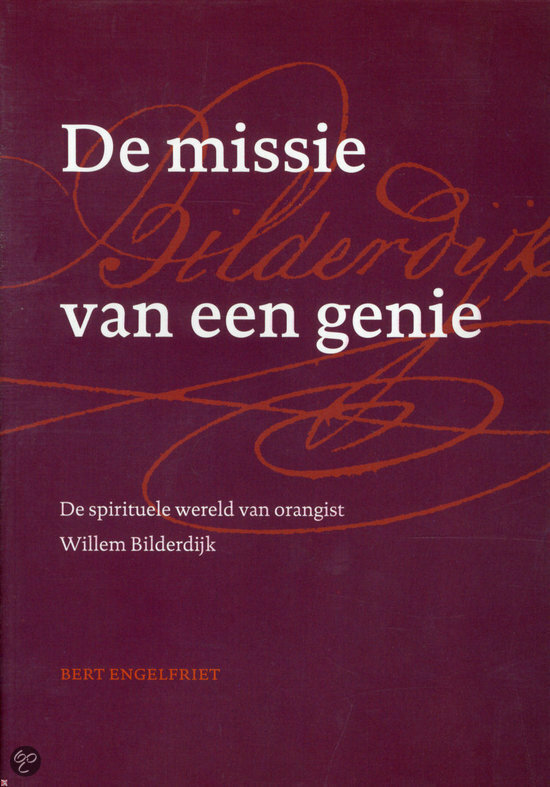 I would like to share with you something of the newest book from Bert Engelfriet: De missie van een Genie, de spirituele wereld van orangist Willem Bilderdijk. (The mission of a genius, the spiritual world of Willem Bilderdijk) I wrote before about Willem Bilderdijk (1756-1831). It’s one of the worlds greatest spirits, at least from the last centuries. However, he was mostly slandered but also received at lot of honor, not at least from a faithful group of Reformed people. It’s like Israel, you are for or against. I tend to see him as the last prophet of the Dutch christian nation, as a remnant of the Protestants, a God-given pillar who encouraged people to go back to the roots. Before the spiritual destruction began. And the roots are principles of God alone. He was quite against the French Revolution and its contemporary development of the human principles. He counterfeited the rational spirit which was the mainstream of the Enlightenment. To cut off the roots would be ending in Nihilism, he said. In stead of that, he recommended the “spiritual, inner enlightenment and Godly inspiration.” (p.19) The motif of his works relies on the principle of Godly inspiration through His word. Bilderdijk was quite original. He was aware of the principle of all things from God through which everything exists. An important thing for him to deal with is self-esteem (zelfgevoel), the inner feeling. This, were it is from higher truth, is connected to the elders, the wise men, the root of the truth and to the Holy Spirit. Bilderdijk had a great wish to join the best of the Jewish and Christian heritage together. So that the Messiah of the Jews and Christians will be recognized as the same. “We (Christians) abide Him with you (Jews), that so exalted Ruler; Your God is our God, your Savior our Prince.” (p.97) He expected a oneness but in quite another way as many church-people do: The Jews must be reinforced in their elderly faith. As a remnant of the Protestants he was very clear to say that the (protestant) church didn’t come free from the old Roman powers. He said that the early church soon after their flourishing state, dismissed the spiritual principle of Christ and welcomed the Roman principles of power. (p.115) Also later reformations didn’t lead to a breakthrough of the “kingdom of God” because they sought too much support by worldly authority. There’s a lot more to say about this beautiful book, but it costs me too much time for now. The 70 years prophecy is the foundation and the demarcation of the period of exile of the Jewish people. Not only that. It is advanced with a deeper dimension to Daniel. When Daniel saw that the 70 years of exile were fulfilled, right away he was shown that there were 70 weeks in it. The time of the Messiah wasn’t there yet. More tings had to be happen. This prophecy also was picked up by John. He clarified the period of the Christian church or better to say the “grafted in gentiles” dominated by the antichrist. The main subject of the revelation to John is the 2 millenia Christianity with at the end the glorius state of the united nations under the reign of the Messiah. The 70 years prophecy is a basic outline with several dimensions, I like to distinguish three. The 1th dimension is a literally fulfilment of the prophecy of Jeremiah. The 2th is a literal fulfilment of the 70 sevens (70 weeks, 490 years) by Daniel. The 3rd dimension is a more in detail but also hidden prophecy about the time of the final end of the exile. This reaches until the time in which we live. Why three dimensions? Because the Messiah didn’t come after 70 years. And he didn’t come after 70 weeks of years too. (as a glorious king) He is still waiting to reveal himself in glory to the world. That’s because of the sins of the people He loves most. According to Jewish custom the coming of the Messiah depends on the obedience of the Jewish people. If the people are not ready, He delays. Also abortus causes delaying said the chief rabbi of Israel. But after all, time is set and He would come definitely and scripture gives us all we need to keep the hope and faith alive. 1.) Literal fulfillment of 70 years prophecy of Jeremiah. After the first message to Jeremiah, a more in depth information was given to Daniel. Here is to distinguish a literal and a hidden part. The literal part is fulfilled in 490 years (70×7) from “the outgoing word” unto the “cutting off” of “an anointed one” which is Jesus. 2.) The literal part of the 70 weeks prophecy by Daniel. This is a well known prophecy in Christianity which often begins with 457 BCE which with 69 weeks (483years) reaches year 27 CE, the day of Jesus’ crucifixion, the day of the anointed one be cut off. However there are more interpretations, the common scholarly and Jewish one differs. They see Cyrus as the anointed one, the prince, after the first seven weeks, and Alexander Yannai (103-76 BC) the cut off anointed one after another 62 weeks. The 7 weeks unto the anointed prince separated is supported by the original Hebrew text which has an atnach punctuation mark, omitted in most translations. Isaac Newton also distinguish this. More on that below. 3.) The hidden part of the 70 weeks prophecy by Daniel and the apostle John. The hidden part of the prophecy is quite more revealed to John as written in the book Revelations. The keyword there is 1260 days which are years, based on the year-for-a-day principle derived from Ezekiel 4:4-6. It correlates with 3,5 days or half a week. For this part I cling to the Puritan view of the Pope being the antichrist, based on the way Reformers looked at prophecy, called the Historicist method. They speak about a time of a Rise, a time of a Reign(1260years), and a time of a Fall of the antichrist. Each epoch of a rise corresponds with a 1260 later epoch of a fall, e.g. 538 (Papacy got supreme authority of religion) corresponds with 1798 (Papacy lost this authority). In that manner several people predicted the French Revolution. I highly regard sir Isaac Newton in his explanation of this prophecy. And more Puritans, like Robert Fleming (1660-1716), Moses Lowman, etc. And Joseph Philpot (1802-1869) who said that after the Fall the reign of the antichrist continues with liberal powers. And now I think we live in the time where the devil himself is on earth to wipe out the remnants of the faithful. Because he knows his time is ending. And the Protestant church is not better than the Roman: the same problems occur in it. It looks like the wound that is healed after the first fall of the Roman church, also concerns the Protestant church. Along with the Western power of the antichrist, there’s also seen an Eastern Power preventing the true believe called the false prophet, this is the Islam, began around 600 the same time the Pope got power. What we see by the Fall is that the ruling power of the church and the world are ceasing. In 1789 the Enlightenment caused the power of the Pope to cease, at the end of the 19th century the power of the Ottoman empire (Islam) ceased, political power was making room for democracy, the Berlin wall felt down etc. and recently the great power of Money was began to fall by the fall of the Twin Towers. The time is here that the world is lacking a Ruler, a Person who knows what’s right and good for the world. There’s a Messiah already, (In Jewish perspective he’s hidden because of the sins.) and now he’s about to come and to rule the world. There’s much to say about this and I can’t drop it all in one post here, but I would like to share the following with you. According to the historicists view it’s about this time we live, that the antichrist would have its definite fall and destruction. Moses Lowman (1680-1752) was already arguing about an important date (756) were the Pope got his dominion and became a ruler in the place of Christ. 1260 years later he wrote, in 2016, we can expect his definite fall. I found a very interesting place in the scriptures of Isaac Newton where he exposes on the 70 years prophecy. Newton put a period between 7 weeks and 62 weeks in Dan.9:25. He saw the rebuild of Jerusalem also in the future and it must precede the Messiah the Prince 49 years. Given that Jerusalem came under Jewish control in 1967 it gives that the Messiah could come after 2016 according to this calculation. I won’t talk about specific years. I really don’t want to do that. Because it could be harmful for the weak and it can cause a stressed Messianic expectation and history shows that this is not healthy. Lets share something personal, I do not see much difference between the coming of the Messiah or to pass away and enter eternity. The dead for the righteous is a sleep for the body until the resurrection. Are you righteous and faithfull, that’s the question what must bother you most. Now, when you hear His voice, (Ps.95) this day is the most important. And after all, its so easy for us to be wrong. We simply don’t know until time is there. In this broad picture the recent revolutions in the Arabic world fits perfectly. Tyrannical mights overthere have to make place for the only mighty God, the only authority, the by all people of the world recognized One God. Worldly powers disappear in preparation for the Messianic Age. However, the last one who is moving around in this world as an angry lion knowing that his time is up, is the devil, where we are dealing with right now. I don’t know if there would come a Gog-and-Magog-birth-pain before the Messiah appears. Probably this would come, but I certainly don’t see any upcoming antichrist, in contrary to what many believe.